The NAA Ranger II right side. 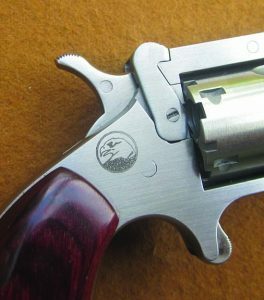 For many gun-people, any mention of North American Arms (NAA) will immediately bring to mind their beautiful little solid-frame revolvers, a very modern version of a classic 19th century design. The factory people at NAA could teach others the true meaning of the word “precision.” And the material is highest-quality stainless-steel. About six years ago, the designers at NAA decided to try something different, their version of the old top-break revolver. They called it the “Ranger.” It was, sort of, an experiment, and only around five hundred of them were made. So, if you come across a Ranger I, grab it — it’s going to become a collector-piece. To give an idea of the size, that’s an average hand. That first version had a classic T-shaped barrel latch that locked onto two frame-posts, and was lifted to open the barrel unit for loading. Since the chamberings were .22 WMR (.22 Magnum) and .22 Long Rifle, there was no question of strength. Quite adequate. Even so, the NAA designers decided they’d like something stronger, and also easier to operate. Good design is timeless! For this one, they went all the way back to the mid-1870s, and Major George Schofield. The old T-latch of the .45 Smith & Wesson Model 3 was quite strong enough for the blackpowder loads of that era, so I think Schofield’s motivation was operator convenience, especially on horseback. The barrel latch is also the rear sight. It was a vertical lever, pivoted on the frame that captured a solid projection on the barrel unit. It was simply tipped rearward to open, much easier than the old lift-toggle. The S&W people liked it, the US Army did also, and in 1876 and 1877 a large number of them were sold to the military. In addition to ease of operation, the latch was also stronger. One other little point of good design is that the hammer, when fully down (as in firing) prevents rearward movement of the latch toward opening. At the instant of firing, it is absolutely locked. To open it, you have to set the hammer on its first step to clear it. I will note here that that initial hammer step is not intended to be a “safety” position. It’s only for loading. 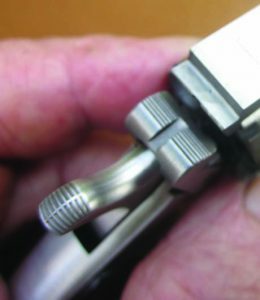 The barrel latch has good serrations on its front edge, and its top is the square-picture rear sight. A small brass post with a rounded top is the front sight. Definitely not a serious target set-up; but quite adequate for a revolver of this type. When I test-fired the Ranger II, all shots were well-centered, and grouping at 15 yards averaged 3 to 4 inches. The latch engages a big ledge on the barrel unit. 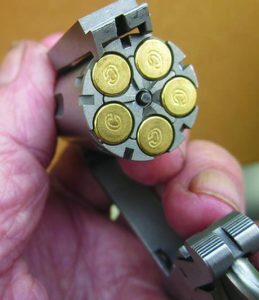 In the old, original top-break revolvers, opening the barrel unit would cause the ejector to rise, flip out the fired cases, then snap back into the cylinder. Because its principal chambering is .22 WMR, the Ranger II is different. In the first part of barrel opening, the ejector does not move. At about two-thirds open, the ejector lifts the cases slightly, for easy removal. The ejector goes back in for loading as the barrel unit is moved back. For safe carrying, fully loaded, you use the safety system found on all of the little NAA revolvers. The hammer is gently let down to engage the hammer nose, the firing pin, with one of the deep notches between each of the chambers. With this system properly set, accidental firing is impossible. Partially opened for loading, the ejector does not move. 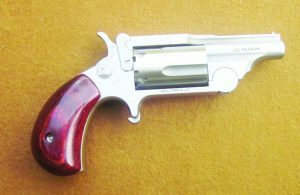 Most of the smaller NAA revolvers are perfect in the role of ultimate back-up. My own application in that category is the tiny solid-frame in .22 Short. 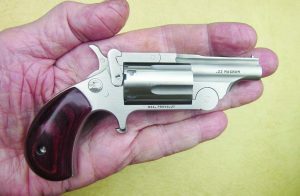 Ranger II is not that small, but it could still be a pocket-piece. The numbers: Weight, empty, is 6.9 ounces; Length, 5.16 inches; Height, 2.81 inches, and width, 1.06 inches. The cylinder holds 5 rounds, and barrel length is 1.63 inches. 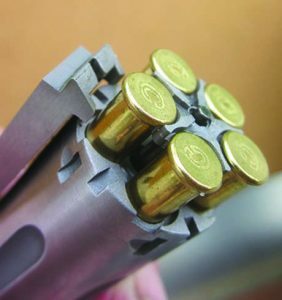 Mention of the short barrel brings to mind performance factors of the .22 Magnum round. If rifle-type ammo is used, you get an awesome muzzle-flash and some velocity loss. But, fortunately, several makers now provide fast-burning .22 WHR loads for use in handguns. You can also get an extra cylinder in .22 Long Rifle chambering, but it has to come with the gun, because of fitting concerns. Opened all the way, the ejector lifts the rounds to this point for removal. The Ranger II comes in a fine, padded and lockable case that is not plastic, not aluminum — it’s steel, with a black crackle finish. The basic gun, in .22 WMR, has a suggested retail price of $479. If the .22 LR cylinder is ordered with it, the figure is $574. As I’m sure you know, you will find it sometimes for less than the MSRP.